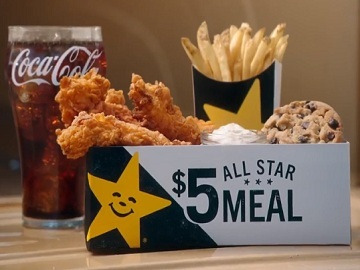 Carl’s Jr. and Hardee’s have launched a series of new ads, promoting the new limited-time $5 All Star Meals. One of the spots, titled “Diesel and Sadness” shows a man choosing between a gas station burrito, filled with diesel and sadness, and a “real meal” as it’s presented the $5 All Star Meals. “Hey, if you got five bucks, you could fill up on a gas station burrito that taste like diesel and sadness. Or you can choose a real meal with three hand breaded chicken tenders fries and a drink.. oh, look at that little cookie sitting there”, says the voiceover in the 30-second spot, concluding that is no better way to spend five bucks. The Hand Breaded Chicken Tender All Star Meal featuring 3-piece hand-breaded chicken tenders, your choice of dipping sauce, small fries, small drink and fresh-baked chocolate chip cookie. Double Cheeseburger & Hot Dog All Star Meal: Charbroiled double cheeseburger on a plain bun, jumbo hot dog, small fries, small drink and fresh-baked chocolate chip cookie. Double Cheeseburger & Onion Rings All Star Meal: Charbroiled double cheeseburger on a plain bun, 4 onion rings, small fries, small drink and fresh-baked chocolate chip cookie. Double Cheeseburger & Spicy Chicken Sandwich All Star Meal: Charbroiled double cheeseburger on a plain bun, spicy chicken sandwich on a plain bun, small fries, small drink and fresh-baked chocolate chip cookie.